Posted February 15, 2011, 11:09 PM. The two well-publicized winter storms coming in from the Gulf of Alaska won't match the magnitude of December's record seven days of rain. They won't even come close, although we could get measurable precipitation most days from Wednesday through Sunday, with a break on Thursday, according to the lastest forecasts. The first storm, due Tuesday night, could bring a quarter to a half of an inch of rainfall before it departs on Wednesday night. 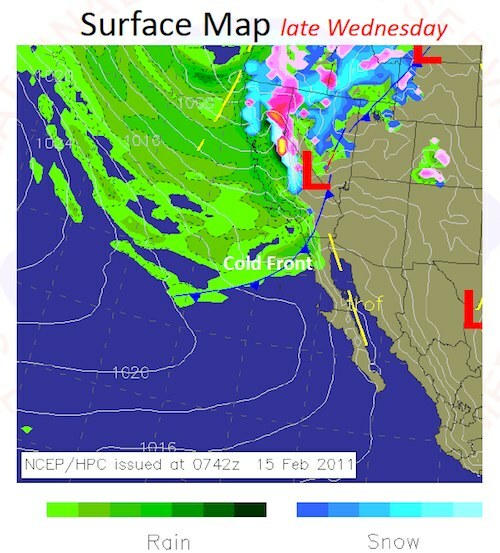 Snow levels in the local mountains will fall to 4,000 feet later on Wednesday as the cold front passes. The second storm, arriving Friday night, is even colder. And contains more moisture. It could dump another inch to an inch of a half of rain, and lower snow levels to under 3,000 feet. If snow levels go lower, places like Beaumont and Banning (in the San Gorgonio pass) might get some snow fall. Snowfall from the second storm in the local mountains could be heavy. The two storms arriving this week represent a more frequent type of winter storm, sweeping down from the northwest with colder moisture from the Gulf of Alaska. Precipitation from December's seven days of rain was an amazing 6.10" to 14.21" in the inland valleys. 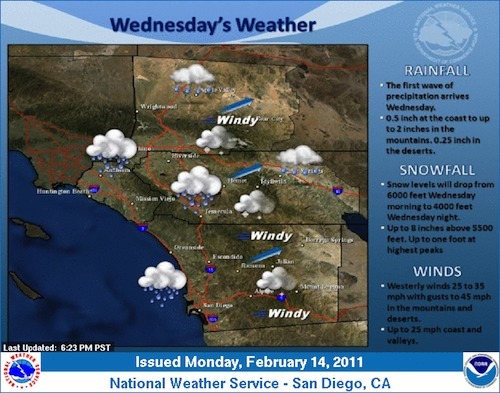 The type of storm was completely different; a low pressure trough sucked a plume of sub-tropical moisture and funneled wave after wave of it at Southern California.